Life Cycle: Adults overwinter in leaf litter and soil, emerging in spring. Young cucurbit plants are especially susceptible to large numbers of adults feeding. This activity can reduce yields and sometimes kill seedlings. Adult females lay eggs near the base of the cucurbit plants. Larvae hatch from eggs to feed on plant roots, pupate, and emerge as adults after about 3 weeks. Emergence usually occurs in late summer and feeding begins on plants and maturing fruits. Feeding damage can make fruit unmarketable. Adult beetles can transmit Bacterial Wilt through feeding on plants. Bacterial Wilt can cause plant decline, reduced yields, and possible plant death. Plants affected: All cucurbits are susceptible to cucumber beetle damage. 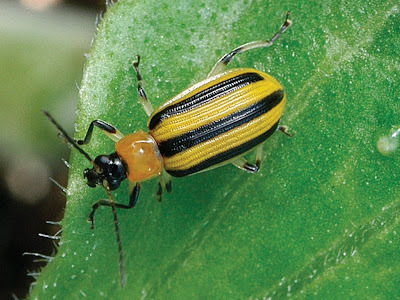 The Spotted Cucumber beetle also feeds on corn, asparagus, and eggplant. Young seedlings and maturing fruit are most affected by feeding damage. Cucumbers and melons are more susceptible to bacterial wilt than squash and pumpkins. Young, vigorously growing plants are more susceptible to bacterial wilt. Control: Spray or dip seedlings with Surround WP (#9661) to deter insect attack. Reapply if it rains or as the plant grows out of the spray. Use a preventative application of Pyganic (#9192/#9532) and then use Entrust (#9068) for the next application, switching between the two for maximum knockdown potential. Use Rotenone-Pyrethrin Concentrate (#9336) as a control. Place sticky traps at plant height to monitor populations. Use pheromone lures inside the sticky trap to attract cucumber beetles away from plants and trap them on the sticky trap. So, for about $800 worth of chemicals I can protect $10 worth of cucumbers? How is that good? But for 50 cents worth of Remay you can protect your $10 worth of cucumbers - and it is reusable! This is amazing, is remay the shave gel?